Tag line: "Only the rainbow can duplicate its brilliance!" The casting of Errol Flynn as the title character in 1938’s The Adventures of Robin Hood was a stroke of pure genius. After watching this classic adventure film, I came away with the distinct impression that, in a past life, Errol Flynn was Robin Hood. With King Richard (Ian Hunter) off fighting the crusades, his younger brother, Prince John (Claude Rains), ascends to the throne of England, unlawfully seizing control of the Kingdom in Richard’s absence. Aided by Sir Guy of Gisbourne (Basil Rathbone) and the High Sheriff of Nottingham (Melville Cooper), John imposes a round of crippling taxes, the money from which he uses to solidify his power. With the rich getting richer and the poor more destitute than ever, Sir Robin of Locksley (Errol Flynn) decides enough is enough, and takes a stand against John and his henchmen. As a result, Sir Robin becomes a wanted man, now known throughout the kingdom as Robin Hood. Robin is joined in his rebellion by such faithful friends as Little John (Alan Hale), Friar Tuck (Eugene Palette) and Will Scarlet (Patric Knowles), and even gains the admiration of Maid Marion (Olivia de Havilland), a member of the Royal Court, with whom he falls in love. But Marion is also being wooed by the sinister Sir Guy, who was promised her hand in marriage by Prince John. Will Robin Hood save England from the tyrannical John and rescue Marion before she becomes Sir Guy’s wife? With the help of his Merry Men, he just might! 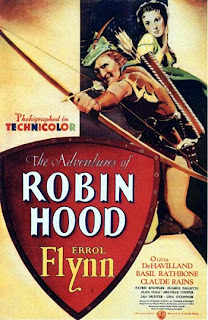 The Adventures of Robin Hood may be the perfect adventure film, from its rousing action scenes (at one point, Robin invites himself to Prince John’s banquet, only to fight his way out a few moments later when the Royal guards descend upon him) to its vibrant costumes and sets, which look absolutely stunning in Technicolor. Along with Flynn’s flawless portrayal of Robin Hood, the supporting cast also shines. As noble as she is alluring, it’s easy to see why Robin fell for Olivia de Havilland’s Maid Marion, and Basil Rathbone is at his evil best as Sir Guy, delivering his lines as regally as any villain in motion picture history. As for Robin’s Merry Men, Alan Hale, who plays Little John, has always been a particular favorite of mine. Aside from his great performance in this film, he was also solid in movies like The Fighting 69th (with James Cagney) and The Private Lives of Elizabeth and Essex (again with Flynn, as well as Bette Davis). Besides, I grew up watching Gilligan’s Island on TV, which co-starred Hale’s son, also named Alan, and he was the spitting image of his father. And where would The Adventures of Robin Hood have been without Claude Rains’ slimy Prince John? In nearly every role, the supporting cast of The Adventures of Robin Hood is as strong as could be expected. 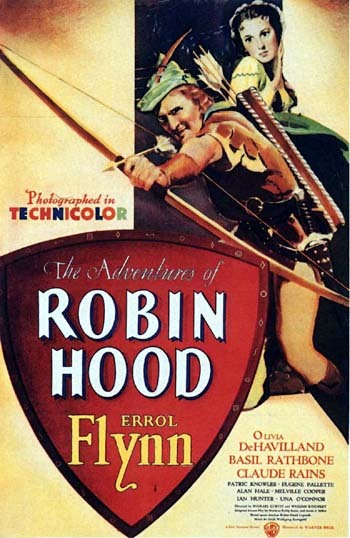 But no more so than Flynn himself, and one of the great joys of The Adventures of Robin Hood is seeing him at the height of his abilities, taking on the role he seemed born to play. Whether battling it out with Sir Guy (the final showdown between the two remains one of the cinema’s finest swordfights) or winning the heart of his leading lady, Errol Flynn completely embodied the part of Robin Hood, and few actors have ever been as magnificently heroic as he was here. I've seen him in other movies, where he gave other fine performances, yet for me, Errol Flynn will always be Robin Hood. This is one of my all-time favorites, and I've become quite a fan of Flynn as well. I love The Sea Hawk and Captain Blood almost as much as Robin Hood. Robert: This is such a fun movie! I had a blast watching this one again. I'm a CAPTAIN BLOOD fan as well, and it's been WAAYYY too long since I've seen THE SEA HAWK...gotta add that to the short list! This is the definitive version without doubt. Flynn was born to a movie star, in colour!